Are you living paycheck to paycheck? If you missed one paycheck, would you still be able to pay your bills on time? Statistics continue to show that over 70% of Americans are living paycheck to paycheck. Bankruptcy is a very close relative to paycheck to paycheck living? Those living paycheck to paycheck are just one illness away from disaster. Just one job layoff away. Just one paycut away. Divorce is a very close relative to bankruptcy AND paycheck to paycheck living! If you are living paycheck, I just have one question. WHY would you put yourself in this position? WHY would you allow your marriage and your financial future to be placed in jeopardy? There is NOTHING worth that for me! If I can not give and save money, my priorities have become messed up! I can not fathom having a car payment, a student loan payment, a furniture payment, credit card payments to the point that I can not even give or save money. Life is all about giving to worthy causes and saving for my dreams. If you are stuck in the paycheck to paycheck world, here are some practical steps you can take to get OUT of that madness! 1. Pay cash for all future purchases. No more debt. It is the first rule of holes – When you are in a hole, stop digging! 2. Spend all of your month's money on paper BEFORE the month begins. INCOME – OUTGO = EXACTLY ZERO. You can get started by clicking on "TOOLS" on the top of the page or by clicking HERE. 3. Refuse to live the lie that you HAVE to have debt. You do not HAVE to have debt. I have personally seen hundreds of people accomplish major improvement in their personal finances … all the way to total freedom of debt (except the house – some including the house!). I want financial freedom so much for you! I feel a HUGE WEIGHT on my heart to help you achieve financial freedom! I want to help you! If there is anything I can do to help you, please contact me! 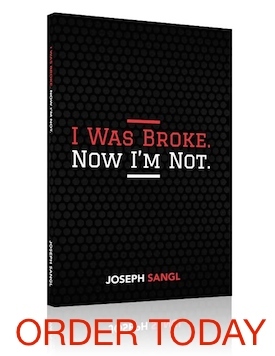 Amen brother Sangl. See you Sunday for that help. ROCK ON JOE!! ROCK ON! Thanks for teaching these principles!